OK, guys, there are a LOT of directions I could go with this video about The Book of Mormon. People have all sorts of questions about it — they want to talk about geography and DNA evidence and honeybees — I’m going to get around to that stuff, but not in this episode. First, people need to have an idea of what the story contained in The Book of Mormon is actually about. This is your official SPOILER ALERT warning. The year is about 600 B.C. The Place: Ancient Jerusalem. The situation: Not good. The people are wicked, they’re rejecting the prophets, like Jeremiah, who you can read about in the Bible. The Book of Mormon follows the path of another prophet, Lehi, and his family. God warns Lehi about an impending invasion from Babylon and tells him to take his family and get the heck outta Dodge. So, Lehi leaves Jerusalem with his wife, Sariah, and their kids. They’ve got four sons: Laman, Lemuel, Sam, and Nephi. The family wanders in the wilderness for several years. Lehi has a couple more kids, Jacob and Joseph, and finally, they end up building a ship and traveling to the Americas. They weren’t the first people to discover the Americas nor the only people there. But once Lehi’s family gets there, some family issues cause a division. The family members that believe in God’s revelations leave with Nephi to start their own settlement. Those that don’t believe stay behind with Laman and Lemuel. This is the foundation for pretty much the rest of The Book of Mormon. Generations pass and both the Nephites and the Lamanites develop into powerful nations. Most of The Book of Mormon is about the relationship between these two nations. Now, just like the Bible, The Book of Mormon has a ton of books in it. The guy who edited all of these books into one anthology was an ancient prophet, a descendant of Nephi, named Mormon. Hence, The Book of Mormon. The first two books were written by Nephi. He then passes the baton to his younger brother, Jacob, who passes it to his son, Enos, who gives it to his son, Jarom, to his son, Omni, etc. Then Mormon throws a few editorial thoughts in there. After that, we continue with the story of a Nephite prophet and king, named Mosiah. After he dies, his best friend’s son, Alma, takes the reigns. He’s both the political and the religious leader of the Nephites. A TON of wars happen in Alma, but there are also some priceless teachings about faith and some great missionary stories about Mosiah’s sons, who were friends of Alma. The next book is Helaman. Helaman was Alma’s great-grandson. More wars and prophecies of Christ in this book. It gets really interesting because there’s a time when the Lamanites actually get their crap together, more so than even the Nephites. Helaman’s grandson, also named Nephi, keeps the record next. At this point, about 600 years have passed since the first Nephi left Jerusalem. 3rd Nephi covers the birth of Jesus Christ. Of course, Christ was born in Bethlehem, so the people in the Americas just had to rely on what the prophets had foretold about Christ, which was quite a bit. They lived the Law of Moses, but they knew Christ would come, and they knew salvation came through Christ. They received signs of His birth, and of His death. 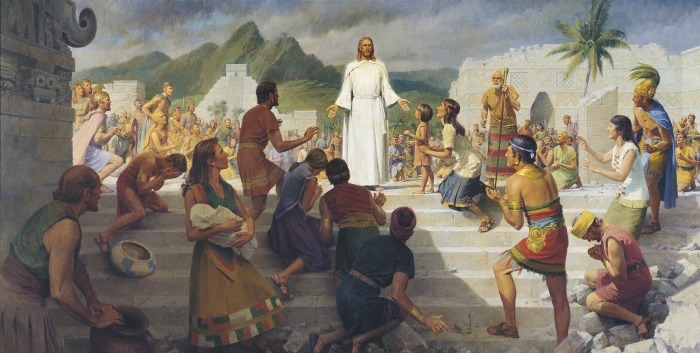 After his death, Christ himself appeared to the Nephites and taught and expounded upon the same gospel He taught the Jews during His life, which we read about in the Bible. This is the main event of The Book of Mormon. Everything is leading up to Christ. After Christ’s ministry in The Book of Mormon, we read in 4th Nephi that there are like two hundred awesome years of peace, everyone is righteous, they’re all prospering in every sense of the word … and then things start to spiral downhill again. Then we get to the Book of Mormon (within The Book of Mormon), which is the history written by our editor, Mormon. In this book he basically describes the complete annihilation of the entire Nephite nation at the hands of the Lamanites. The Book of Ether comes next, which is a flashback to the story of a completely different group of people from the Middle East, fleeing from the Tower of Babel, who came to the Americas centuries before Lehi and Nephi. It adds a ton of depth to The Book of Mormon. And The Book of Mormon ends with the book of Moroni, who is Mormon’s son. Moroni buries the record and then, as an angel like 14-hundred years later, tells Joseph Smith where to find it. Joseph translates it into English, gets it printed, and voila! Now you can read it. If you don’t have a physical copy, you can read it online using the link below. Have a great day, and we’ll see you next time. Here are some quotes from the Book of Mormon to give you a taste of what you will find there. …[My father] spake unto them concerning the Jews—That after they should be destroyed, even that great city Jerusalem, and many be carried away captive into Babylon, according to the own due time of the Lord, they should return again, yea, even be brought back out of captivity; and after they should be brought back out of captivity they should possess again the land of their inheritance. Yea, even six hundred years from the time that my father left Jerusalem, a prophet would the Lord God raise up among the Jews—even a Messiah, or, in other words, a Savior of the world (1 Nephi 10). I, Nephi, was desirous also that I might see, and hear, and know of these things, by the power of the Holy Ghost, which is the gift of God unto all those who diligently seek him, as well in times of old as in the time that he should manifest himself unto the children of men (1 Nephi 10). And it came to pass that the Spirit said unto me: Look! …I looked and beheld the great city of Jerusalem, and also other cities. And I beheld the city of Nazareth; and in the city of Nazareth I beheld a virgin, and she was exceedingly fair and white. And he said unto me: Behold, the virgin whom thou seest is the mother of the Son of God, after the manner of the flesh.And it came to pass that I beheld that she was carried away in the Spirit; and after she had been carried away in the Spirit for the space of a time the angel spake unto me, saying: Look! And I looked and beheld the virgin again, bearing a child in her arms. And the angel said unto me: Behold the Lamb of God, yea, even the Son of the Eternal Father! (1 Nephi 11 – about 600 BC). And it came to pass that the Lord did warn me, that I, Nephi, should depart from them and flee into the wilderness, and all those who would go with me. And we did observe to keep the judgments, and the statutes, and the commandments of the Lord in all things, according to the law of Moses. And it came to pass that we began to prosper exceedingly, and to multiply in the land. And I, Nephi, did build a temple; and I did construct it after the manner of the temple of Solomon save it were not built of so many precious things (2 Nephi 5). And they were scattered upon much of the face of the land, and the Lamanites also. And they were exceedingly more numerous than were they of the Nephites; and they loved murder and would drink the blood of beasts. And it came to pass that they came many times against us, the Nephites, to battle. Wherefore, the prophets, and the priests, and the teachers, did labor diligently, exhorting with all long-suffering the people to diligence; teaching the law of Moses, and the intent for which it was given; persuading them to look forward unto the Messiah, and believe in him to come as though he already was. And after this manner did they teach them (Jarom 1). And it came to pass that two hundred and seventy and six years had passed away, and we had many seasons of peace; and we had many seasons of serious war and bloodshed (Omni). And it came to pass that in the commencement of the ninety and second year, behold, the prophecies of the prophets began to be fulfilled more fully; for there began to be greater signs and greater miracles wrought among the people. Now it came to pass that there was a day set apart by the unbelievers, that all those who believed in those traditions should be put to death except the sign should come to pass, which had been given by Samuel the prophet (3 Nephi 1). And it came to pass that he (a prophet named Nephi) cried mightily unto the Lord all that day; and behold, the voice of the Lord came unto him, saying: Lift up your head and be of good cheer; for behold, the time is at hand, and on this night shall the sign be given, and on the morrow come I into the world, to show unto the world that I will fulfil all that which I have caused to be spoken by the mouth of my holy prophets (3 Nephi 1). And it came to pass that the words which came unto Nephi were fulfilled, according as they had been spoken; for behold, at the going down of the sun there was no darkness; and the people began to be astonished because there was no darkness when the night came. there was no darkness in all that night, but it was as light as though it was mid-day. And it came to pass that the sun did rise in the morning again, according to its proper order; and they knew that it was the day that the Lord should be born, because of the sign which had been given…And it came to pass also that a new star did appear, according to the word (3 Nephi 1). And now it came to pass, if there was no mistake made by this man in the reckoning of our time, the thirty and third year had passed away; And the people began to look with great earnestness for the sign which had been given by the prophet Samuel, the Lamanite, yea, for the time that there should be darkness for the space of three days over the face of the land. And it came to pass in the thirty and fourth year, in the first month, on the fourth day of the month, there arose a great storm, such an one as never had been known in all the land. And there was also a great and terrible tempest; and there was terrible thunder, insomuch that it did shake the whole earth as if it was about to divide asunder. And there were exceedingly sharp lightnings, such as never had been known in all the land. And the city of Zarahemla did take fire. And the city of Moroni did sink into the depths of the sea, and the inhabitants thereof were drowned. And the earth was carried up upon the city of Moronihah, that in the place of the city there became a great mountain. And there was a great and terrible destruction in the land southward. And thus the face of the whole earth became deformed, because of the tempests, and the thunderings, and the lightnings, and the quaking of the earth (3 Nephi 8). And it came to pass that there was thick darkness upon all the face of the land, insomuch that the inhabitants thereof who had not fallen could feel the vapor of darkness; And there could be no light, because of the darkness, neither candles, neither torches; neither could there be fire kindled with their fine and exceedingly dry wood, so that there could not be any light at all; And there was not any light seen, neither fire, nor glimmer, neither the sun, nor the moon, nor the stars, for so great were the mists of darkness which were upon the face of the land. And it came to pass that it did last for the space of three days that there was no light seen; and there was great mourning and howling and weeping among all the people continually (3 Nephi 8). And it came to pass…they heard a voice as if it came out of heaven…Behold my Beloved Son, in whom I am well pleased, in whom I have glorified my name—hear ye him. And it came to pass, as they understood they cast their eyes up again towards heaven; and behold, they saw a Man descending out of heaven; and he was clothed in a white robe; and he came down and stood in the midst of them; and the eyes of the whole multitude were turned upon him, and they durst not open their mouths, even one to another, and wist not what it meant, for they thought it was an angel that had appeared unto them. And it came to pass that he stretched forth his hand and spake unto the people, saying: Behold, I am Jesus Christ, whom the prophets testified shall come into the world (3 Nephi 11). And it came to pass in the thirty and sixth year, the people were all converted unto the Lord, upon all the face of the land, both Nephites and Lamanites, and there were no contentions and disputations among them, and every man did deal justly one with another. And they had all things common among them; therefore there were not rich and poor, bond and free, but they were all made free, and partakers of the heavenly gift (4 Nephi). And it came to pass that when three hundred years had passed away, both the people of Nephi and the Lamanites had become exceedingly wicked one like unto another. And it came to pass that the robbers of Gadianton did spread over all the face of the land; and there were none that were righteous save it were the disciples of Jesus. And gold and silver did they lay up in store in abundance, and did traffic in all manner of traffic (4 Nephi). And now behold,… I fear lest the Lamanites shall destroy this people; for they do not repent, and Satan stirreth them up continually to anger one with another. For so exceedingly do they anger that it seemeth me that they have no fear of death; and they have lost their love, one towards another; and they thirst after blood and revenge continually. And they have become strong in their perversion; and they are alike brutal, sparing none, neither old nor young; and they delight in everything save that which is good; and the suffering of our women and our children upon all the face of this land doth exceed everything; yea, tongue cannot tell, neither can it be written (Moroni 9). Now I, Moroni, write somewhat as seemeth me good; and I write unto my brethren, the Lamanites; and I would that they should know that more than four hundred and twenty years have passed away since the sign was given of the coming of Christ. Behold, I would exhort you that when ye shall read these things, if it be wisdom in God that ye should read them, that ye would remember how merciful the Lord hath been unto the children of men, from the creation of Adam even down until the time that ye shall receive these things, and ponder it in your hearts. And when ye shall receive these things, I would exhort you that ye would ask God, the Eternal Father, in the name of Christ, if these things are not true; and if ye shall ask with a sincere heart, with real intent, having faith in Christ, he will manifest the truth of it unto you, by the power of the Holy Ghost (Moroni 10).